For every Chinese New Year Reunion Dinner, I will usually visit a different restaurant each year. This year (2012) is no different. Soup Restaurant is not a new name to me. In fact, it is one of my favorite casual dining place with my own family. Interestingly, Soup Restaurant has a rather reasonable dinner package for this year of dragon. Most importantly, portion was sufficient and well prepared. 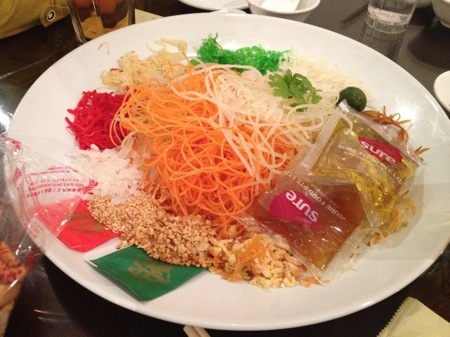 One can savor the crispiness of the fresh vegetable with both Salmon and Wolf Herring fish, blended with the regular Yu Sheng sauces. 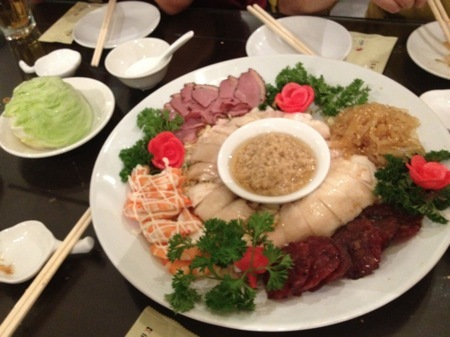 b) Cold platter – smoked ham, house branded Samsui Chicken, jelly fish, salad prawn and bak kua. 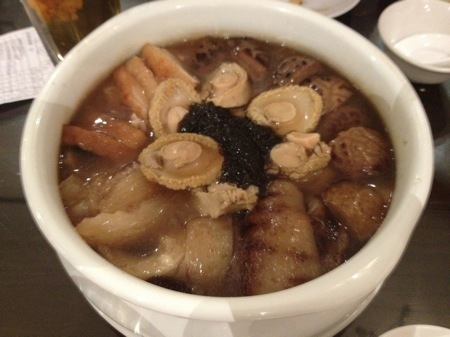 c) Well simmered Fortune pot with good delicacies – abalone, wild mushrooms, sea cucumber, pork, fish maw etc. You may want to give a try for your next year Chinese New Year Reunion dinner. Gong Xi Fa Cai!